A Giving Greetings exclusive! 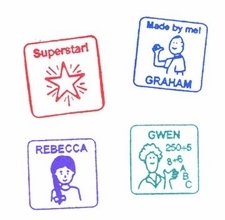 These adorable picture name stamps feature popular Boardmaker Picture Communication Symbols used by special educators around the world. Many look alike styles for boys and girls. Your choice of five ink colors. Great for signing school work, artwork and cards. The Picture Communication Symbols (c) 1981-2019 by Tobii Dynavox.. All Rights Reserved Worldwide. Used with permission. Boardmaker is a trademark of Tobii Dynavox.